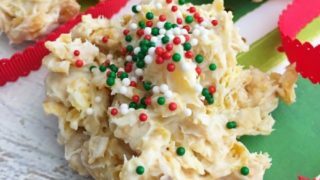 It’s the holiday season and sometimes things are so hectic it is difficult to make time to bake or cook holiday centric-dishes. 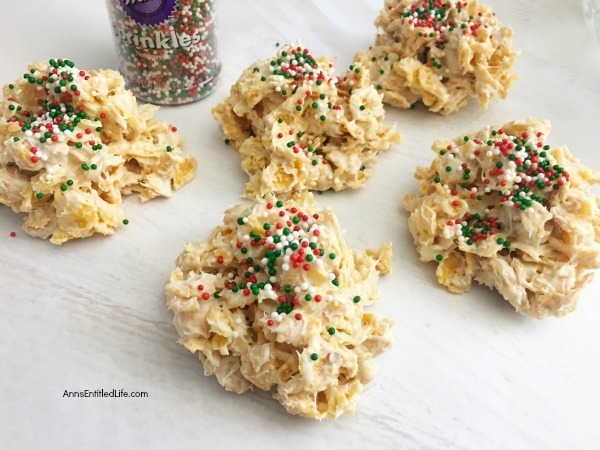 But everyone has time to make these super easy cornflakes Christmas clusters. This simple 4-ingredient recipe is festive, tasty, and you can make them in about 5 minutes. These are a great tasting holiday treat your whole family will enjoy. 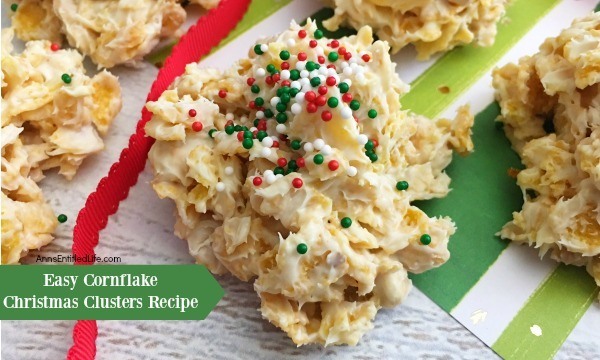 • This recipe makes about 12 Cornflakes Christmas Clusters. This recipe doubles beautifully if you would like to make a larger batch. 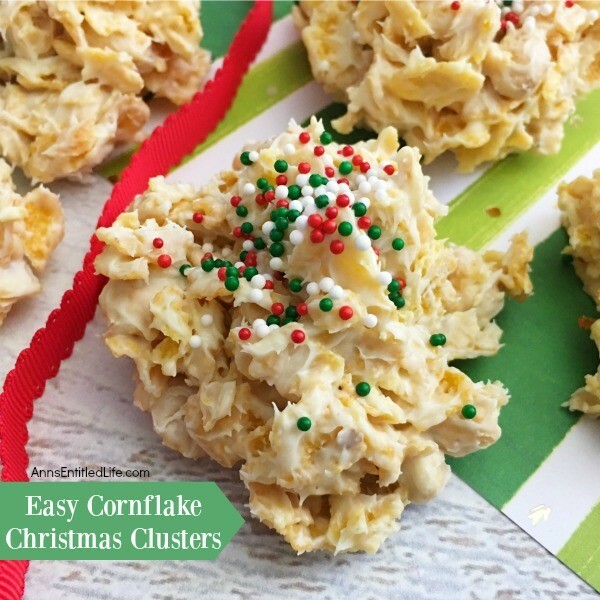 • These are called “Christmas” clusters, but could be used with all red sprinkles for Valentine’s Day, Green for St Patrick’s Day, Purple or Pink for Easter, Red, White, and Blue sprinkles for Independence day, etc., etc. • The mixture comes out soft but will harden as the chips dry. 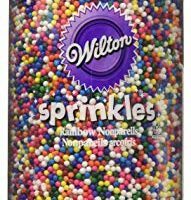 • Decorative sprinkles such as nonpareils or jimmies work great! • If you want to color the white chocolate chips, feel free to do so! • Line a baking sheet (or another flat tray) with parchment paper. Set aside. 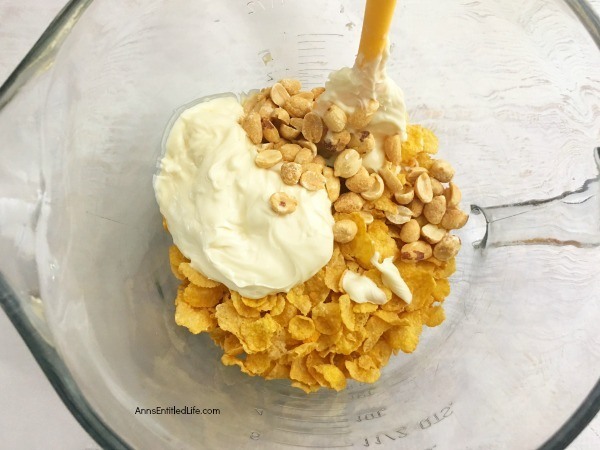 • Mix in 3 cups of cornflakes and ¼ cup of chopped peanuts into the melted white chocolate chips, and stir until completely coated. 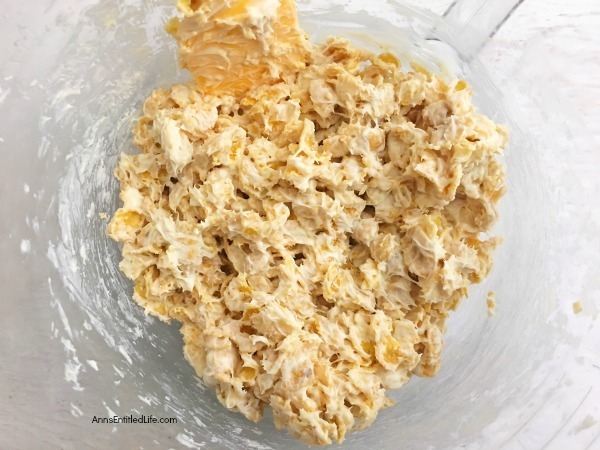 • Drop the cornflake mixture onto the prepared parchment paper using a tablespoon (don’t worry, the mixture won’t stick together well but will harden keeping everything together). 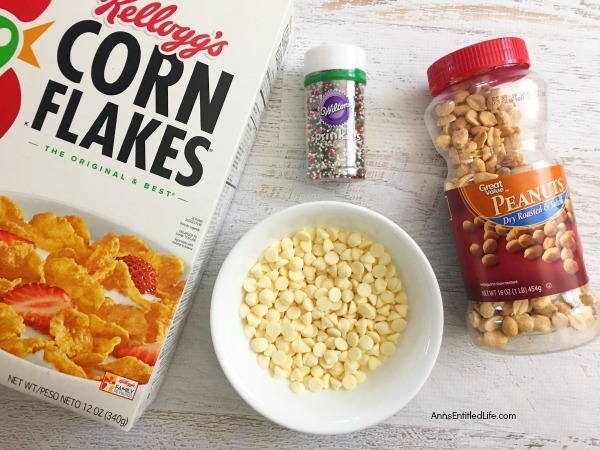 • Immediately sprinkle the cornflake clusters with some holiday sprinkles. 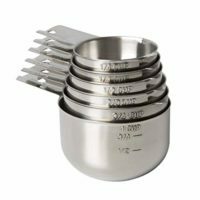 • Let the clusters set for 30 minutes or until chocolate has hardened. 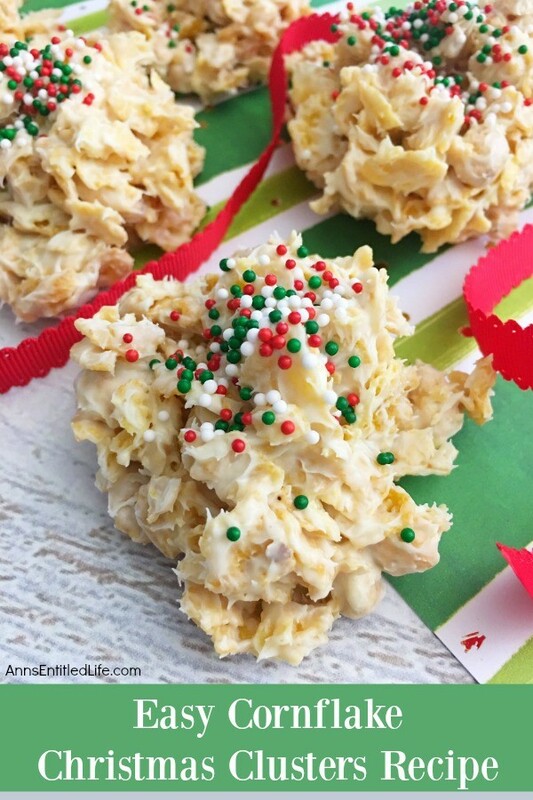 This simple 4-ingredient recipe is festive, tasty, and you can make them in about 5 minutes. 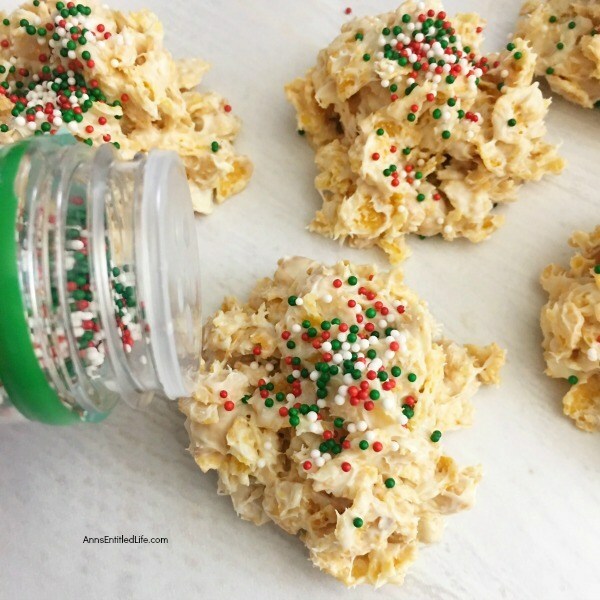 These are a great tasting holiday treat your whole family will enjoy. 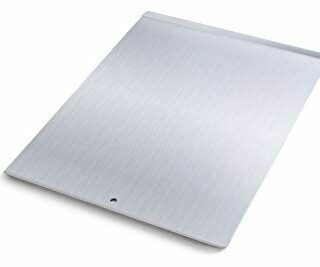 • Line a baking sheet (or other flat tray) with parchment paper. Set aside. 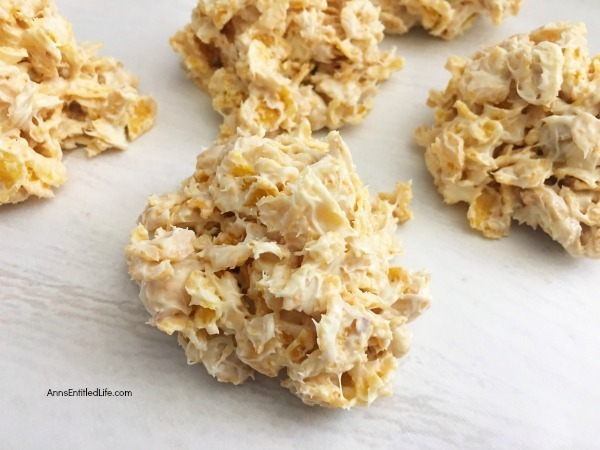 • Drop the cornflake mixture onto the prepared parchment paper using a tablespoon (don't worry, mixture won't stick together well but will harden keeping everything together). • Peanut Butter Lumps of Coal Recipe – This no-bake, easy to make peanut butter lump of coal cookie recipe is a fun update to traditional lump of coal cookies. These peanut butter cookies are soft, moist, delicious, and only 4-Ingredients! • Easy Chocolate Peanut Butter Ball Recipe – These delicious, no-bake Chocolate Peanut Butter Balls are simple to make! Your entire family will enjoy these simple candies. Indulge during the holidays, as a special treat, during snack time or anytime! • Chocolate Cashew Clusters – Homemade candy does not get any easier than this Chocolate Cashew Clusters recipe! These chocolate cashew clusters are tasty, fast, and simple to make. Surprise your family with these delicious candy delights tonight!